Creating a work of philosophy that is both deeply rich in meaning and accessible to a non-philosophically-trained audience is a daunting undertaking for an author. In spite of the difficulty inherent in an attempt to meaningfully address the claims of relativism and constructivism in a simple and succinct manner, Paul Boghossian succeeds famously. Boghossian is the Silver Professor (and former chair) of Philosophy at New York University. As a graduate student in Philosophy at Princeton, he became intrigued with the field of epistemology when he studied under the eminent relativist philosopher Richard Rorty. Rorty was infamously known for saying that truth was “whatever his contemporaries let him get away with”. In this book, his former student is not letting him, or any other relativists for that matter, get away with anything in the area of truth. 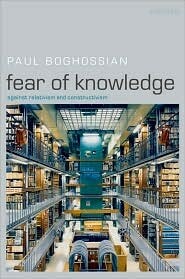 Boghossian’s argument, and the apt subtitle for the book, is against relativism and constructivism. He is not attempting to provide arguments in defense of a realist epistemology; rather, he attempts to defeat the arguments typically given in favor of a relativistic or constructed epistemology, thereby leaving realism as “the last man standing”. In order to legitimately present defeaters for these views, Boghossian presents what he believes are the three strongest areas for argument, which he classifies as: fact constructivism, constructivism about justification, and the theory that rationality comes from socially constructed pragmatism. Boghossian is concerned that Rorty’s constructivist views have come to permeate the academy at large, especially the humanities. Therefore, he addresses this book to non-philosophers and philosophers alike. Taking a complex concept such as epistemology and distilling it into non-technical language is a daunting task, but Boghossian performs it quite well. He is extremely careful to explain terms and provide real world examples, even citing the novel, The Amazing Adventures of Kavalier and Clay, in an attempt to place the non-philosophical reader at ease. However, Boghossian is an analytical philosopher at heart and therefore can’t seem to get away from numbered premises with lettered variables and logical conclusions. It is in the heart of some of these analytic arguments that the non-technical reader will have to slow down and possibly re-read sections in order to fully follow his line of argumentation. However, the knowledge gained is well worth the additional effort. Before taking on the views of his former teacher, Boghossian argues against the “cookie cutter” factual constructivism of Nelson Goodman, which seems to be popular throughout the social sciences in spite of the fact that it appears extremely problematic philosophically. Per Goodman, we carve reality up with pragmatic concepts; that is, we employ terms to group things by separating them from the rest of reality. For instance, if we take a cluster of atoms and draw a line around them, thereby creating the concept of a molecule, molecules come into being. When we conceptually describe something, we cause it to come into existence. We may all draw our lines independent of one another, and none is more accurate representation of how things actually are. This is because there is no way things actually are; there are simply the descriptive concepts I employ and the concepts you employ. Having adequately and fairly described his opposition’s position, Boghossian presents three devastating critiques of the fact constructivist view. First, how do we descriptively cause things that predate human history? He cites a damning example in which Bruno Latour, a well-known French constructivist sociologist, asked how Ramses II could have died in 1213 BC from tuberculosis (as scientists working on the mummy of Ramses claimed), when that bacillus hadn’t been discovered until 1882 AD? While this anecdote is humorous, it points out the ludicrous nature of following this view to its logical end. As tuberculosis surely predated our discovery of it, so too there are certainly some items that must have predated human history (e.g., mountains, oceans, etc.) Yet, according to this constructivist view, these objects only came into being once a human formed the descriptive concept of them. Secondly, Boghossian argues it is conceptually incoherent to say that a “mountain,” which entails being mind independent, is dependent upon a mind. When we mentally form the descriptive concept of “mountain”, we ascribe many attributes to this concept (e.g., large, rocky) one of which is the fact that this massive geological structure jutting out of the earth is independent of our mind. Claiming it is dependent upon our mind is similar to someone declaring that no dogs have fur. We would probably respond that the individual making that assertion must not understand what the concept of a dog describes, because one of the defining attributes of a dog is that it is covered in fur. Thirdly, and Boghossian believes most convincingly, the best argument against fact constructivism is that it violates the law of non-contradiction. When it says that one social group may construct the fact that P, and another construct the fact not-P, since both facts are socially contingent, fact constructivism would have to then state it is possible both that P and not-P. Thus, it cannot be true. Boghossian then turns his argument to Rorty’s global relativism, which avoids all of the above traps of the “cookie cutter” constructivism. Rorty makes all truth claims relative and employs pragmatism to justify the claims. Per Rorty, when we say “there are mountains”, we aren’t carving up sections of reality and creating mountains, instead we are simply talking in a way that works for us. It is helpful for us to think of mountains as predating us, but it is not simply true that mountains predated humanity, for in Rorty’s system it never makes sense to say anything is just plain true in an objective sense. Boghossian summarizes Rorty’s view as, “According to a way of talking that we find useful to accept, we can say it is true that mountains predated us”. However, we must remember that when Rorty assents to the statement “it is true that mountains predated us” he is not making any statement about reality or any claim about the objective truth of the matter, he’s merely saying that according to a theory he accepts, things tend to work a lot better when we employ words like “true”. While agreeing with the traditional opposition to this view, Boghossian doesn’t support the typical arguments given for it, namely that the global relativist finds himself in a dilemma between self refutation (they claim their relativism to be absolutely true) or that their global relativism is only true relative to some theory, in which case we can ignore them. He believes the possibility exists that relativism is only relatively true to some theory, but that it may be worthwhile for all of us (non-relativist and relativist alike) to accept that theory. Therefore, he presents what he believes is a stronger argument against global relativism. Boghossian offers a question to the global relativist: “you state there are no absolute facts of the form ‘there were dinosaurs’, but are there absolute facts of the form ‘according to a theory that we accept there were dinosaurs?’” If the relativist answers, “Yes, there are”, then they are back to being self-refuting as their global relativism is now accepting absolute facts about beliefs. However, if they reply, “No,” it means they must reformulate the proposed sentence about dinosaurs to say, “According to a theory we accept, there is a theory, and according to this theory that we accept, there is a theory, and according to this theory we accept…there were dinosaurs”. This rapidly descends into an infinite regression of “according to a theory we accept, there is a theory…” qualifiers to the original statement concerning dinosaurs. Therefore, the real dilemma is between self-refutation and utterances that can only be said to be true in some unintelligible infinite regression. Boghossian argues that the key to the success of the relativist/constructivist view is not its philosophical strength, as he believes he has demonstrated several shortcomings throughout the book, rather it is the feeling of satisfaction the cultural relativist appears to derive from being able to claim that any purported knowledge with which they disagree is based upon a social value they do not share and is therefore of no import. In short, it gives them an easy out and an ability to not have to intellectually defend their beliefs against competing truth claims. Boghossian hopes he can convince would-be relativists to examine the incoherence of this system of belief and avoid the siren call of the apparent emotional good feeling associated with being seen as open-minded and non-judgmental. He finally points out a fatal difficulty of this view: “if the powerful can’t criticize the oppressed, because the central epistemological categories are inexorably tied to particular perspectives, it also follows that the oppressed can’t criticize the powerful” (130). After successfully arguing against fact constructivism, constructivism about justification, and the theory that rationality comes from socially constructed pragmatism, Boghossian summarizes his thesis: “The intuitive view is that there is a way things are that is independent of human opinion, and that we are capable of arriving at belief about how things are that is objectively reasonable, binding on anyone capable of appreciating the relevant evidence regardless of their social or cultural perspective” (130). Boghossian presents the constructivist/relativist views accurately and fairly and defeats the strongest formulation of their supporting arguments in a way that is easy to follow and understandable to the non-technical reader. This short book should be required reading for all humanities professors and all who care about presenting sound arguments for a realist epistemology. This article originally appeared in Volume 12 (2009) of The Denver Journal, a publication of the Denver Seminary, and is reproduced by the kind permission of the editor.